The Committee honors Professor Sullivan for her important scholarship at the intersection of religion and law in the United States. Beyond the religious studies guild, Sullivan’s public scholarship on religion and her work as an expert witness have had an important impact in courtrooms, prisons, military units, and government offices from city halls to the State Department. Her research and critical theory situates the relationship between these traditions of cultural authority within a broader comparative context, both theoretically and cross-culturally. Whether speaking to an emerging online community of committed interdisciplinary thinkers on The Immanent Frame (a project of the Social Science Research Council) or as the author of four monographs on religion as a source of powerful cultural authority that functions in tension with the authorities of American nationalism and positive law, she has led her colleagues across fields in developing a comparative phenomenology of religion in contemporary legal contexts. Throughout her career, Winni Sullivan maintained her commitment to the public dimensions of religion. 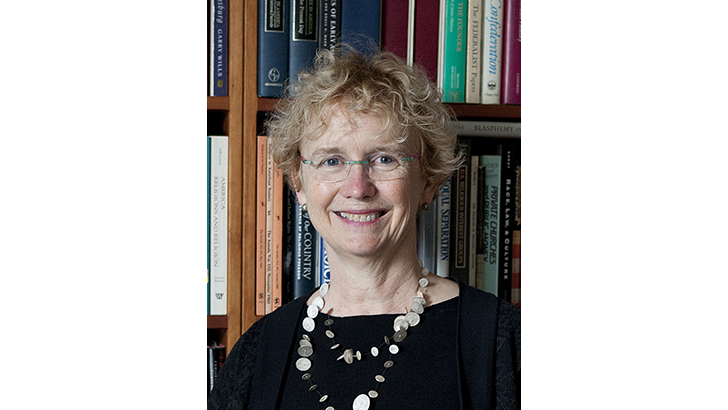 With skills, interests, and insights from her career as a public- and private-sector attorney, as well as a scholar of religion, she has contributed significantly to the field of socio-legal and critical legal studies, challenging and constructively engaging policymakers and jurists as an influential scholar and critical theorist of legal history. This award recognizes her intellectual creativity and power, and also notes the fact that she has now earned honors from two of Martin Marty’s namesakes—the other being her 2005–06 Senior Fellowship at the Martin Marty Center of the University of Chicago Divinity School. At this year’s Marty Forum (A19-251, Sunday, November 19, at 3:00 p.m.), Professor Sullivan will be interviewed by Laurie Patton, president of Middlebury College, for an engaging dialogue about her life and work. All Annual Meeting participants are encouraged to attend. Sullivan began her career in the arts. She received her BA from Cornell University in the theatre arts in 1971, where she was an assistant costume designer for two years. She went on to earn her JD from the University of Chicago law school, where she served as an editorial assistant of the Supreme Court Review. Sullivan’s commitment to public dimension of law was evident from her first summer internship, where she served as a research assistant at the University of Chicago Law School Sentencing Project, under Professor Hans Zeisel. Beginning in 1974, Sullivan practiced law for six years, first as an attorney with the Chicago-based firm at Keck, Mahin & Cate. In 1980–81, she moved to the public sphere as the assistant to the director of the Bureau of Competition of the Federal Trade Commission and as attorney adviser to then-Commissioner Robert Pitofsky. Sullivan returned to the University of Chicago to pursue a PhD in the academic study of religion and was awarded her doctorate in American religious history and the comparative study of religion. In addition, she studied at the Catholic Theological Union in Chicago. Her work since has bridged the academic study of religion and work and practice in American law. Her research method attending to the phenomenology of religious life has fostered conditions for her sophisticated theoretical work on religion and positive law as dynamic and mutually constituting cultural forces within history. In addition to her other current university appointments, Sullivan is also an affiliated faculty member in the Islamic Studies Program. Her prior academic appointments include a position as assistant professor at the Department of Religion at Washington and Lee University, then dean of students and senior lecturer in the anthropology and sociology of religion at the University of Chicago Divinity School, and later associate professor and professor of law at the University at Buffalo Law School, The State University of New York. Amidst her teaching and administrative responsibilities, Sullivan has produced four monographs that analyze legal practices and discourses about religion. These give particular attention to the context of actions brought to enforce the religion clauses of the First Amendment and related legislation. Her 2014 book A Ministry of Presence: Chaplaincy, Spiritual Care, and the Law, published by University of Chicago Press, received the AAR Book Award for Excellence in the analytical-descriptive studies category. In Ministries of Presence, Sullivan focuses on the legal regulation of government chaplaincies, attending to how the government has developed partnerships with private organizations. This phenomenon of joining of public and private forces has produced a particular understanding of the nature of the religious needs of Americans, she argues; a new kind of religious universalism has emerged that locates religious authority not in institutions, but in individuals. With Princeton University Press, Sullivan has published The Impossibility of Religious Freedom (2005) and Prison Religion: Faith-based Reform and the Constitution (2009). She is also the author of Paying the Words Extra: Religious Discourse in the Supreme Court of the United States (Harvard University Press, 1994). Recently, Sullivan has been a member of several leading team research projects sponsored by the Luce Foundation. “The Politics of Religion at Home and Abroad,” her most recent theme, follows the three-year project “Politics of Religious Freedom: Contested Norms and Local Practices.” From these collaborations, Sullivan coedited The Politics of Religious Freedom with Elizabeth Shakman Hurd, Saba Mahmood, and Peter Danchin in 2015. Sullivan is also coeditor of the 2001 After Secular Law with Robert A. Yelle and Mateo Taussig-Rubbo and the 2013 Varieties of Religious Establishment with Lori Beaman. She has written an extensive number of articles and book reviews. Sullivan also stands out as a senior leader fostering rigorous and analytically demanding online conversations among scholars across disciplines on The Immanent Frame, a project of the Social Science Research Council. Among her many accolades, Sullivan has earned prestigious fellowships from the Guggenheim Foundation (2010–11), the National Humanities Center (2006–07), and the American Council of Learned Societies (2010–11). She was a member of the Institute for Advanced Study in Princeton, and received a Charlotte Newcombe Dissertation Fellowship. This year (2017–2018), Professor Sullivan is a visiting scholar at the American Bar Foundation. Winnifred Fallers Sullivan has led a new generation of scholarship by drawing upon the skills fostered as a practitioner of law and a theorist of religious life. Treating trial transcripts as cultural texts, she joins methods from legal anthropology, socio-legal studies and the academic study of religion to illuminate American law as a force that shapes the practice and representation of religion in contemporary life. Sullivan’s work is grounded in the particular: she situates and critiques American law about religion with rich appreciation of their context in American religious and legal history. “I brought to these cases my experience and interest as a trial lawyer in the courtroom as well as my training as a scholar of religion,” says Sullivan. The field of religious studies, cultural studies, and legal studies are much enriched by her sophisticated presentation of the multiple models of, and discourses about, religion that operate as norms. The Marty Award recognizes Sullivan for her leadership in rethinking legal secularism through separationalism, in making visible otherwise tacitly operating theologies of American exceptionalism, in teaching us as her colleagues about the power of contingencies in the history of US Constitutional law, and in modeling intellectual courage in rethinking American interests served through policies of in religious freedom. For this important work, and much more, the AAR’s Committee on the Public Understanding of Religion is delighted to honor Winnifred Fallers Sullivan with the 2017 Martin Marty Award. We hope you will all join us for the Marty Forum on Sunday, November 19 at 3:00 p.m.